A downbeat story of two boxers at different career stages but possibly united in a common destiny, Fat City is beautifully grim. There is nothing to celebrate, but much to admire, as director John Huston trains his cameras on the often intentionally neglected corners of society. 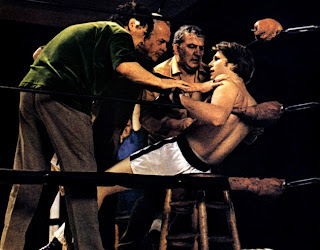 Aging boxer Billy Tully (Stacy Keach) and young upstart Ernie Munger (Jeff Bridges) have a chance encounter at the local YMCA in a depressed neighbourhood of Stockton, California. They spar for a few minutes and go their separate ways, but not before Billy advises Ernie to seek out a trainer named Ruben (Nicholas Colasanto). Physically imposing but not naturally talented, Ernie makes a tentative start to his boxing journey under Ruben's guidance, experiencing both wins and losses in his early bouts. Ernie also gets into a relationship with the innocent but lively Faye (Candy Clark). After she gets pregnant, they get married, and Ernie's nascent boxing career sputters. Meanwhile, Billy's life is headed on a steadily downward trajectory. Feeling sorry for himself and with only the briefest of past glories to sustain him, Billy hooks up with the hard-drinking, foul-mouthed and easily combustible Oma (Susan Tyrrell). Both Billy and Ernie have to resort to menial farm labour to place bread on the table, but while Ernie appears at ease with the occasional foray into the ring, Billy still dreams of a serious return to the sport, and teams up again with Ruben for another shot at glory. With the emphasis on character and the agony of opportunities slipping away, Fat City sometimes slows to a crawl, waiting for Billy or Ernie to make the next, often wrong, decision, or to shake off the most recent drinking binge. But the drama is always propelled back in to motion, thanks to Keach and Bridges delivering powerful performances. Keach is a picture of moroseness, physically deteriorating and rarely smiling as he only sees hope in the rear-view mirror. Bridges is brighter, a man none too clear on the future but willing to smile as he greets it. Compared to the glamour and glories residing at the pinnacle of boxing, Fat City is in a different world. Here, men get battered with no hope of any reward other than miserly pay to afford the next beer. Billy has no notable life skill, not even as a good boxer, and yet stepping back into the ring at his advanced age is the best that he can do to even hope for a better next week. Ernie may or may not be headed to the same place as Billy, but his prospects are not good. Already responsible for a wife and child and with only rudimentary boxing skills, it is difficult to imagine a future for Ernie that is much better than Billy's. Billy and Ernie are only able to attract women who are as depressed or naive as they are. Susan Tyrrell earned a Best Supporting Actress nomination for her role as Oma, a highly charged, over-emotional woman so deep into the dead-end zone of life that she even manages to disgust Billy. The scenes between Billy and Oma are irresistibly painful to watch due to the raw destroyed humanity on display: a man and a woman with very little left to offer, and even the support that they provide to each other has an hourly half-life. Candy Clark as Faye is perhaps the most optimistic character in the movie, a mix of mild manipulation and child-like innocence that she works to her advantage to snag Ernie. 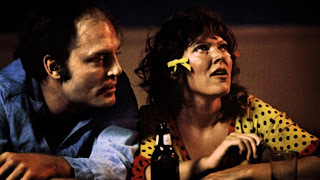 She is too clueless to realize his potentially severely limited value as a catch, but Fat City allows Ernie and Faye at least some self-perceived hope, drawn from relatively narrow experience with life, Ernie not yet encountering his life-defining moment. Working from the Leonard Gardner screenplay (who adapted his own book), Huston captures without judgement the societal and human wreckage drifting towards the scuzzy end of the river. Fat City is an observant witness to lives squandered in pursuit of a desperate dream that was never there.